Dating from about 1880, this original wallpaper design by Morris & Co. is known as 'Poppy' or 'Wreath'. It shows clearly how William Morris's confidence in creating highly sophisticated pattern repeats had evolved by the late nineteenth century. The design's rich colours, scrolling foliage and effect of three-dimensionality are typical of Morris & Co.'s output from the mid-1870s onwards. Like the famous 'Acanthus' paper (Circ. 297-1955) from which it borrows the motif of stylised scrolling foliage, it is characterised by large-scale, very dense patterns where the relationship between background and foreground is closely interwoven. These later designs required a more complex printing technique and a far greater number of individual printing blocks. This made the papers more costly than Morris's simpler, earlier designs. Less medieval in style than 'Fruit' (E.299-2009), this design borrows more from the scrolling patterns of Jacobean floral embroidery. The draughtsman responsible for this technically adept drawing may not have been Morris, as his strengths were more conceptual than illustrative. 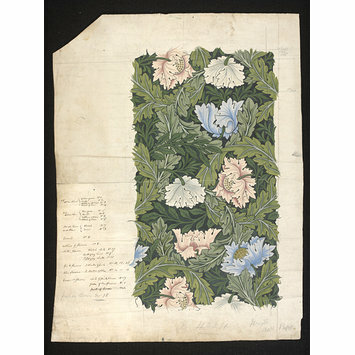 Instead, it is possible that the designer George Wardle (c. 1834-1910) executed this design for production, working from Morris's first version of the design, which is now in the Art Gallery of South Australia, Adelaide. Wardle was an excellent recorder of pattern and managed the Morris studio throughout the 1870s. This design was intended as a guide for the printer to use when matching the colours. Pencil notes with instructions about the colours have been added to the drawing on the front and on the reverse. In addition to this design, the V&A holds specimens of the actual 'Wreath' wallpaper produced by Morris and Co. in different colourways. (E.500-1919, E.501-1919, E.535-1919). 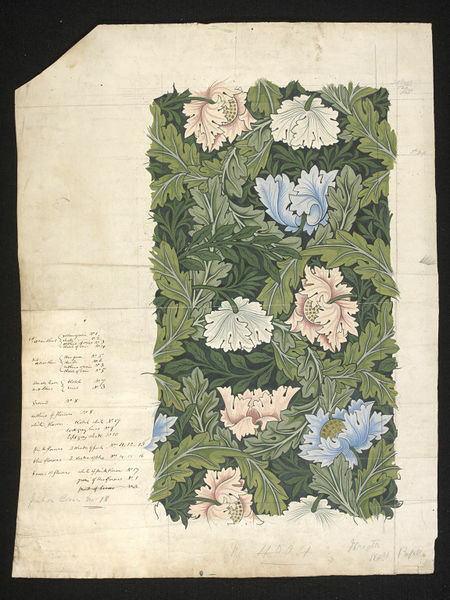 Design showing poppies in pink, blue and white against a dense ground of swirling acanthus leaves, in various shades of green, with a wide border of paper around the rectangular design on which are technical annotations, for production. The top left corner of the paper has been cut and removed. Printed on reverse of design. Stamped in black ink within an oval on the reverse of the wallpaper. On a label stuck to the reverse of the wallpaper. These might be edition numbers. In pencil within brackets on reverse of design. Technical instructions handwritten in pen and ink arranged in a column on the left margin of the design. The last instruction at the bottom of the column is in pencil. Handwritten in pencil beneath the design in the centre and to the left bottom. The number is probably an edition number. Technical instruction written in pencil in the top right corner with the last instruction positioned three inches below the second last one. Design for 'Wreath' wallpaper by William Morris for Morris & Co, about 1880. Harvey, Charles and Press, Jon. William Morris. Design and Enterprise in Victorian Britain. Manchester Uniersity Press, 1991. p.46 and 78.